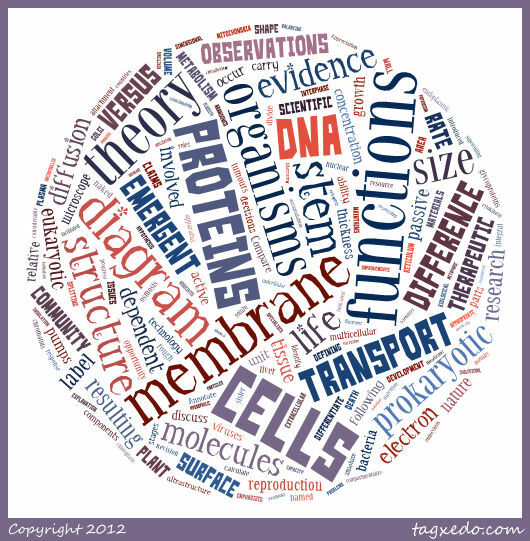 A single page revision summary of the Cells SL topic. All the different aspects of the cells topic on a single A3 sheet, for revision. By completing short questions or explanations students are forced to review the whole topic and complete an overview of the main concepts in the topic. It helps students to identify areas in need of extra revision and gives less confident students a useful set of facts to learn. Brainstorm the topic as a whole class. Keep notes of key ideas. Hover over the image to enlarge the words. This will prompt ideas for the brainstorm; clicking a word opens a Google search for that word. Complete the A3 revision worksheet about the Cells topic . You should use your lesson notes, and your text book to help you. Avoid looking on the internet as half the revision is thinking of the answers for yourself. Work in small groups (2 or 3) to create several different questions about material in the topic using these question starters. Write a collective list of all the questions individuals in the group have invented. Chose one question at random. Discuss the possible answers to this question as a group. Individually write a list of the new ideas about the topic which have come out of the discussion. Note any new questions which arise. Repeat the process with another question. This activity is aimed at those students who need help to make their revision effective, but it is useful for all students. The three short activities are really just suggestions. The worksheet could be a simple homework task. Brainstorm the topic asking students to recall as many parts of the topic as they can. Record these on the whiteboard. Students use their text books and notes to complete the unfinished phrases on the worksheet. By generating their own questions students will discuss the concepts in increasing detail. This will help to illustrate the understanding they have gained while studying the topic and develop their curiosity. It is good to begin by explaining the criteria you will look for in evaluating 'powerful questions', although the main objective is to engage students in an evaluative discussion of the topic. At the end the graph will show four sets of questions. In the top right of the graph there will be the most powerful questions. These questions may not have easy answers. Top left quarter of the graph will show interesting questions which should be easily solved. The lower part of the graph shows questions that are not so interesting at the moment. find answers to some of the post-it note questions. make a revision presentation on one part of the topic.